In a Vase on a Monday: So you say it’s all over? / Montagsvase: Du meinst, alles sei vorbei? You all know how difficult I find it to pick flowers in my own garden but alas, it’s seedhead time! So I happily join Cathy’s meme today with my humble vase featuring Allium aflatunense „Purple Sensation“ and Angelica archangelica, a very architectural biennial. And in case you’re worried: No, it’s not over, because these plants have seeded about profusely and will add to the beauty of our garden again next year. Go over to Cathy to see what she and other bloggers have put in their vases today! Ihr wisst, wie schwer es mir fällt, Blumen in unserem Garten zu pflücken, aber es ist die Zeit der Samenstände! Deshalb mache ich heute voller Freude bei Cathys Montagsvase mit – voilà meine bescheidene Vase mit Allium aflatunense „Purple Sensation“ und Angelica archangelica, ein eindrucksvoller zweijähriger Doldenblütler. Keine Sorge, es ist keineswegs vorbei, denn diese Pflanzen haben sich kräftig versamt und schmücken den Garten nächstes Jahr wieder. Schaut bei Cathy rein, damit ihr sehen könnt, was sie und andere Blogger heute in die Vase gezaubert haben! Und weil die Angelica so zauberhaft ist, hier noch ein Porträtbild 🙂 Fröhlichen Montag allerseits! And because the Angelica is so pretty, I dedicate a vase to her only 🙂 Happy Monday everyone! Seed heads are lovely in a vase, I’m saving mine for winter when there may not be any flowers to pick. The blue vase is lovely too. Annette I also had trouble picking flowers in my garden, but I found I could use those that were heavily producing so it never appeared as though something was missing. But I do love the seedheads which I will be using soon as we run out of flowers…stunning in their effect. Hi Donna, you see there’s a lot to pick but I just prefer to enjoy them in the garden…without picking, sentimental maybe? Bravo for your decision to use seed heads. They can be quite attractive, as yours certainly are. A great idea. Thanks, John, and there’s such a variety out there! Lovely seedheads and they will keep looking good as long as you want them. Oh Marlies, ich musste so lachen!!! Lieber nicht, die müssten wir in der Schubkarre arrangieren. Hab eine schöne Woche! I love Allium seedheads (although, sadly, the large-flowered Allium don’t grow well in my area of Southern California). 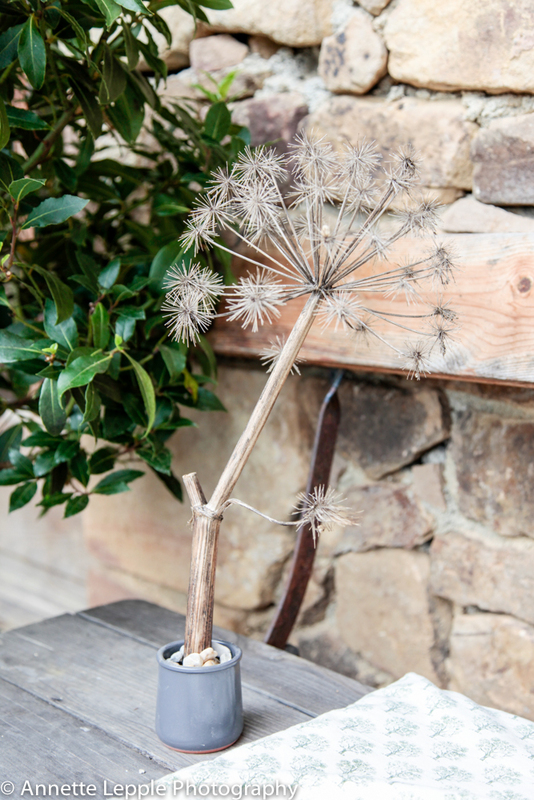 I don’t think I’ve seen a seedhead from an Angelica before but your photo makes me think I should try growing some. 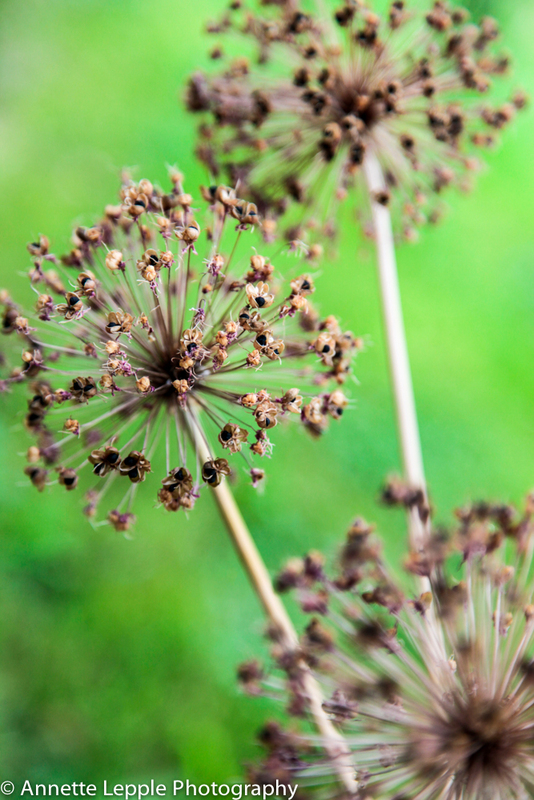 Superbe plant, Kris, and insects love them too as all Angelica. My kind of arrangement. Lovely. I have picked the seed heads (at the garden where I work) and hung them in a dry space to save them for Christmas when I shall spray them. Is you blue vase by Italian company Bitossi? It looks like one of their Rimini Blu range. Very trendy again. It’s a bit weird choosing it in the middle of summer but that’s me! I might spray them too if they still look good. Didn’t know Bitossi but just googled it – lovely blue vases. Don’t know if ours comes from them though but I like it. 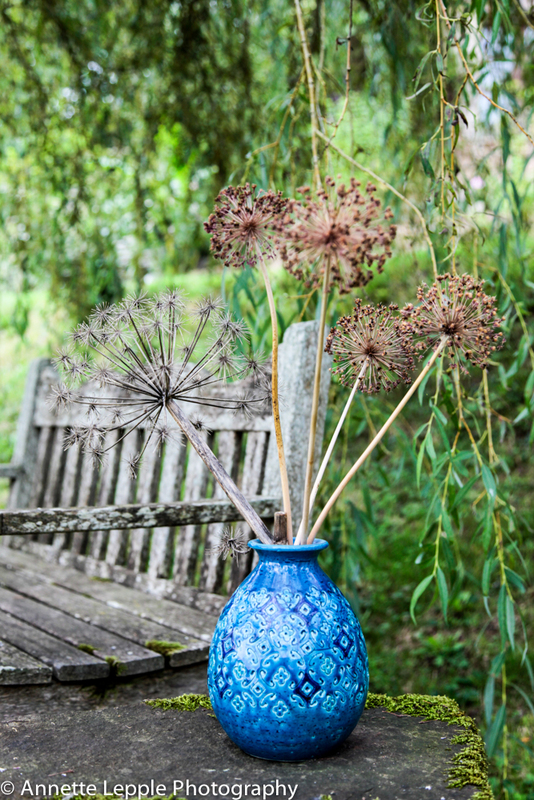 I love all sorts of seed heads, but today it was your beautiful vase that really caught my eye! Great effect Annette! Pleasure, Cathy, and a lunch break doing this type of thing is so low in calories, I can only recommend it 😉 PS: The title for the vase was in my head before I came up with the content…I just like being a bit bizarre at times! Annette, the vase of seed heads seem perfectly placed atop the mossy, stone ledge. Your blue vase is gorgeous one. Thanks, Suzie, that vase definitely seems to stand out. Lovely Annette!! I have been collecting seed heads as well to save and use through the winter. Hi Julie, I know it’s more a thing for later but I don’t know if they’ll still look that good. Great idea! I will have to remember that–especially as summer fades into colorful autumn. I especially like the allium after it is passed prime. They last a long time and have such an architectural form. The last photo really makes that point. Wonderful plants, I love them all…lots of new varieties available but some are very new and thus still expensive. A most elegant and long lasting display Annette. Stunning seedheads and what a glorious vase. I am very glad its not over! Your vase is beautiful as are your photographs Annette. 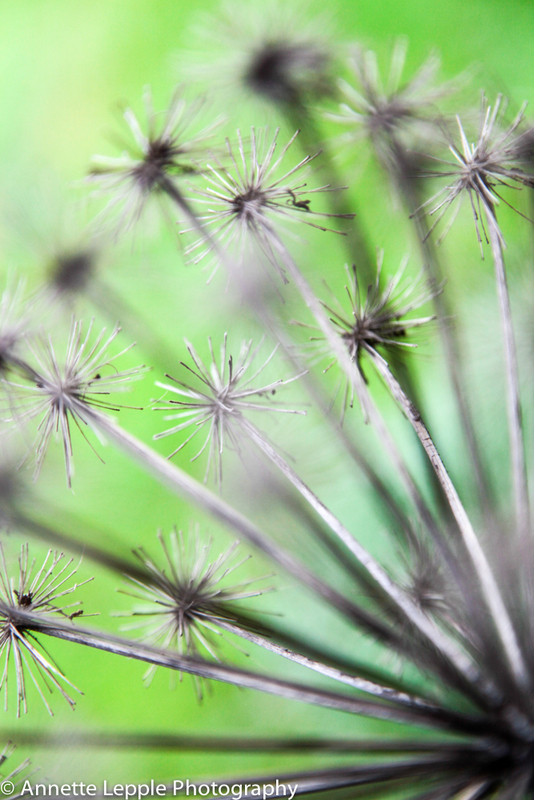 There is great textural beauty in seed heads. They are so important in extending interest in the borders – so why not in vases? I plan to use some in later vases, but for now, am making the most of the last of the blooms. Beautiful, I’m still to much into the blooms to consider anything dried yet, but I understand what you said about enjoying the flowers in the garden more. Also I like your thoughts on spraying them for Christmas. I need to take a look around here and see if there’s anything that might look good in a little gold or silver! 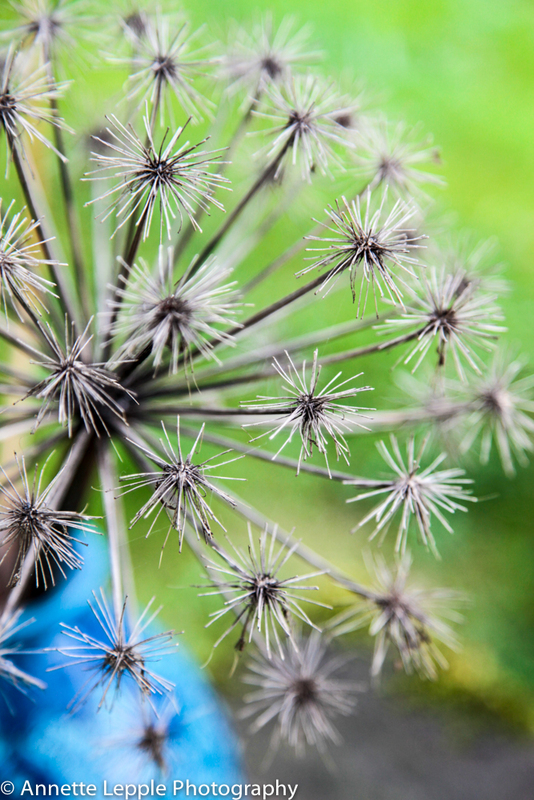 The Allium seed heads are really worth leaving up, I used to always cut them back when the foliage died.